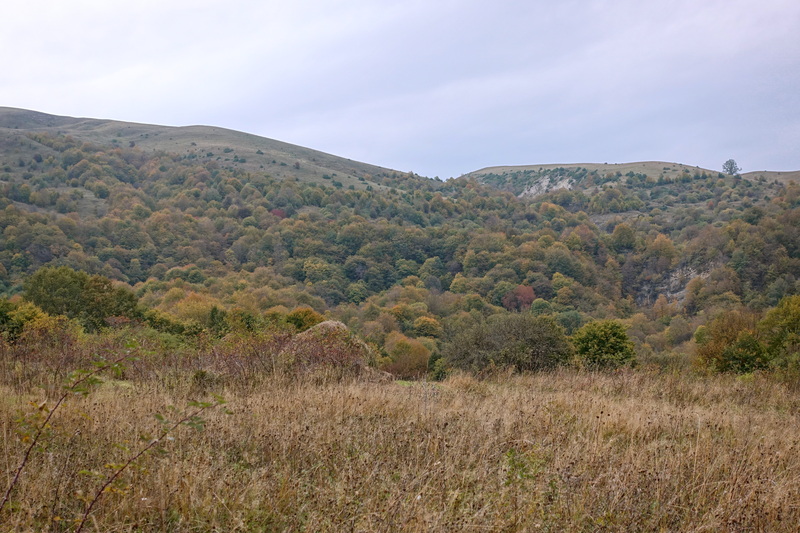 After a night of hearing jackals running around of tent, we awoke to a cold autumn morning. The nights weren’t quite freezing yet, but the temperatures were certainly dropping. We ate our breakfast in the tent, waiting for the sun to warm up the mountain air. 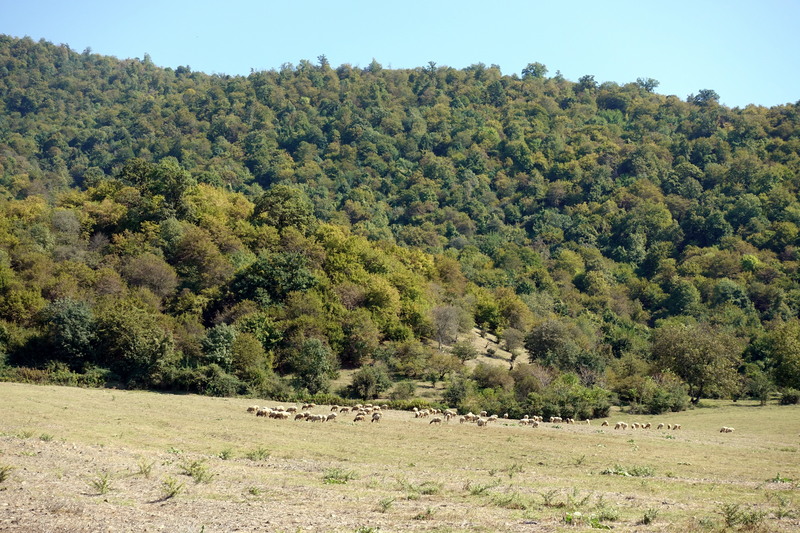 As we were leaving our campsite, we passed by a shepherd (as always seems to be the case) and were stopped by a group of protective shepherd dogs. When a shepherd is nearby, the dogs usually don’t mind us, but we were getting quite close to the sheep and these ones wouldn’t back down. Seeing that we were stopped, the shepherd used this opportunity to chat with Cédric about the usual (where we’re from, where we’re going). 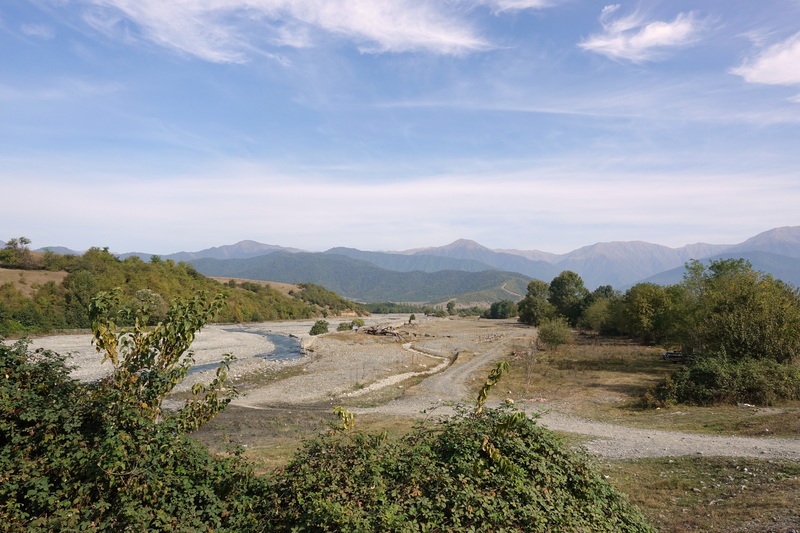 Once on the road, we continued along towards the Azerbaijan/Georgia border. 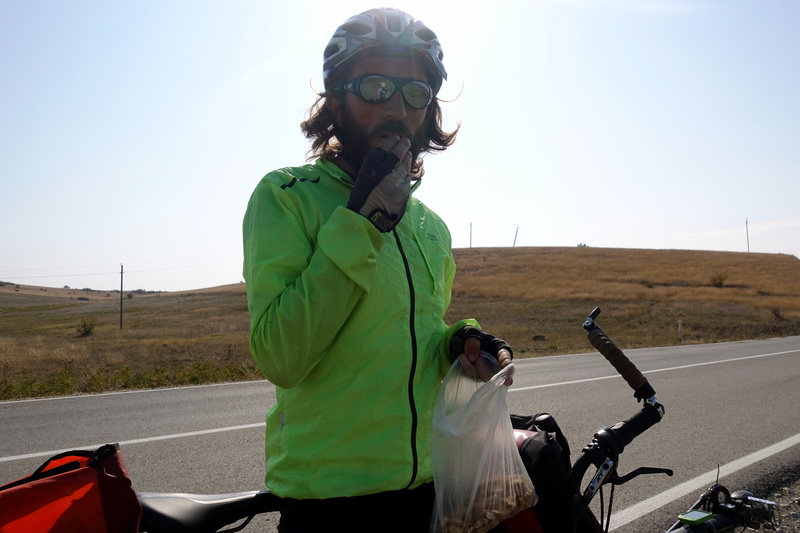 We made a snack stop in Zaqatala, where Cédric was chided by an old man for wearing shorts. Apparently hairy legs are inappropriate, but we didn’t give too much thought to the man’s comments and continued eating our pastries on the sidewalk. The closer we cycled towards the border, the more the roads felt deserted. 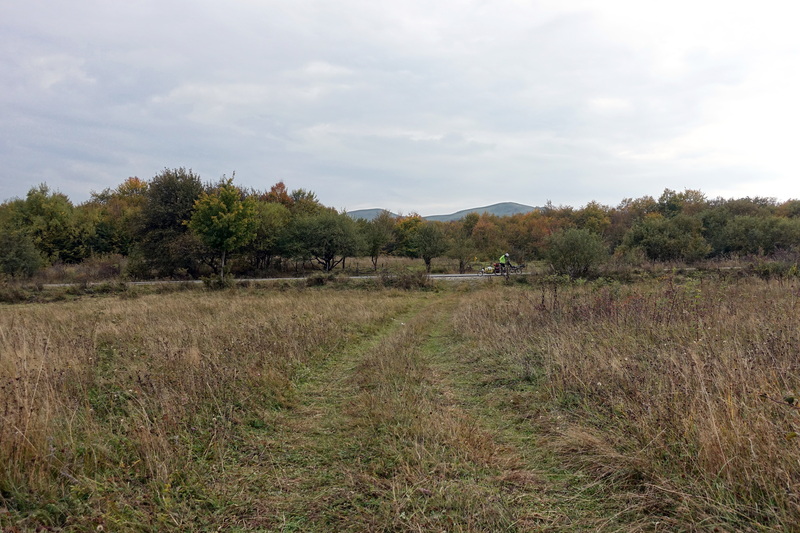 There would be a few international semi-trucks or Ladas that would pass us, but mostly we had the road for ourselves. 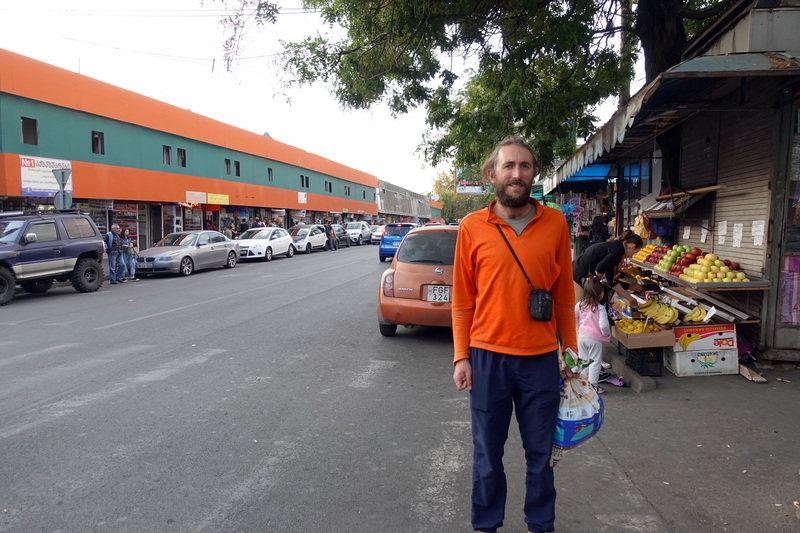 We stopped in the last border town to buy some coffees and get rid of our loose change. 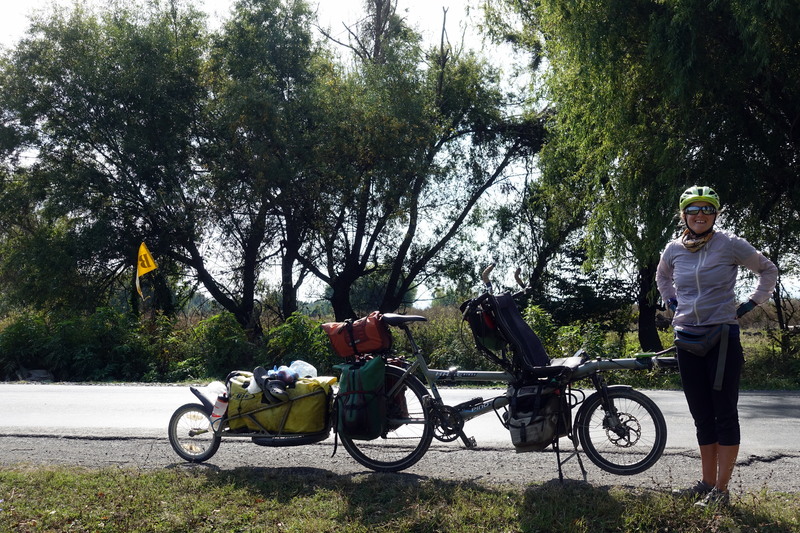 Just as we were approaching the border, we spotted another cyclist (a Canadian girl) and chatted about our trips. 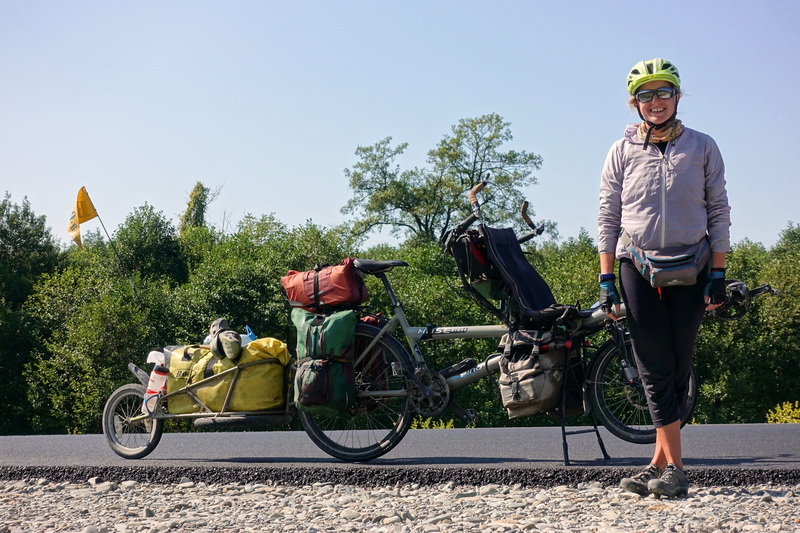 She had picked up a used bike and gear in Dushanbe, Tajikistan and also traversed the Pamir and Uzbekistan. 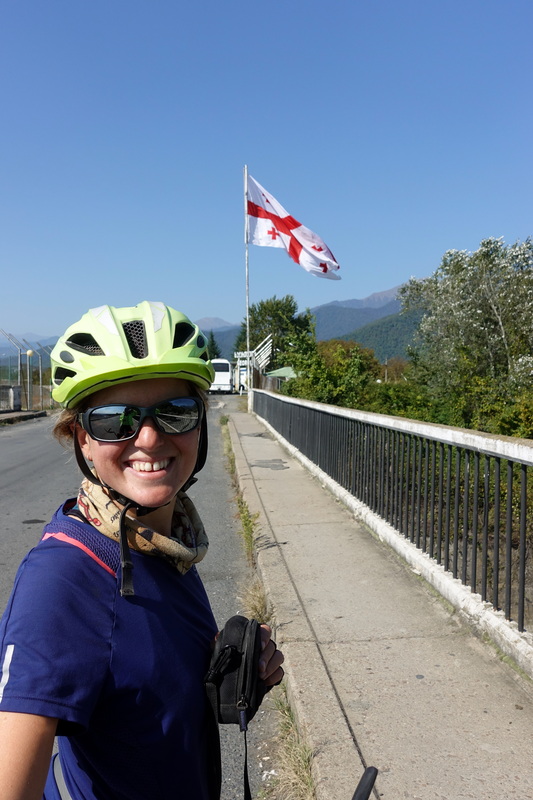 We decided to cycle the last few kilometers together across the border checkpoints and into Lagodekhi. 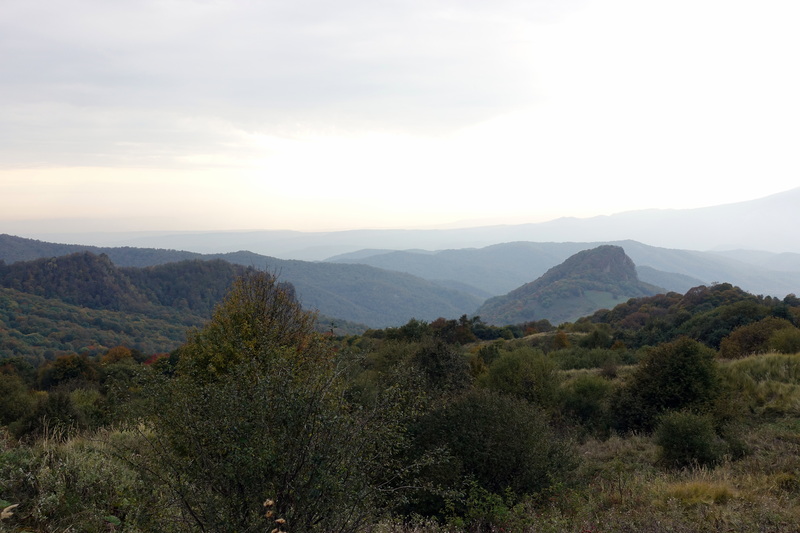 Once in Georgia, we stopped in the town to sort ourselves out – did we need a SIM card? Was there a bank or ATM? (For us, after cycling through the ‘Stans, it’s now weird to expect small towns to have functioning ATMs). As we were chatting, an older guy decided to back up his car, nearly ramming into the front of the Hase Pino. 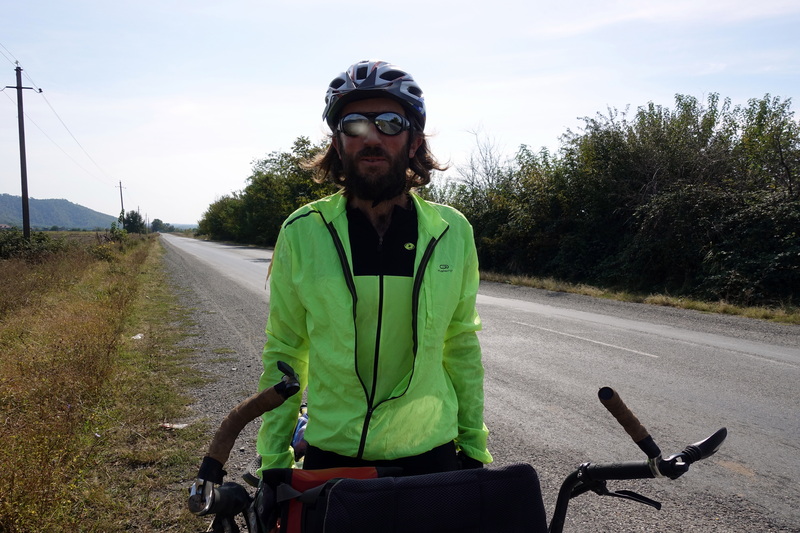 Cédric knocked on his car, telling the guy to stop, and then a shouting match ensued. From his gestures, we were apparently the ones at fault for having our bike parked close to his car (although he gave no warning of his intention despite standing next to us and checking out the bikes just minutes before – had he continued, our bike would not have had much, but his shiny Mercedes would have got a long autograph/scratch signed by our steel pedals…). Cédric and I had been told about Georgian driving habits, including their fury. 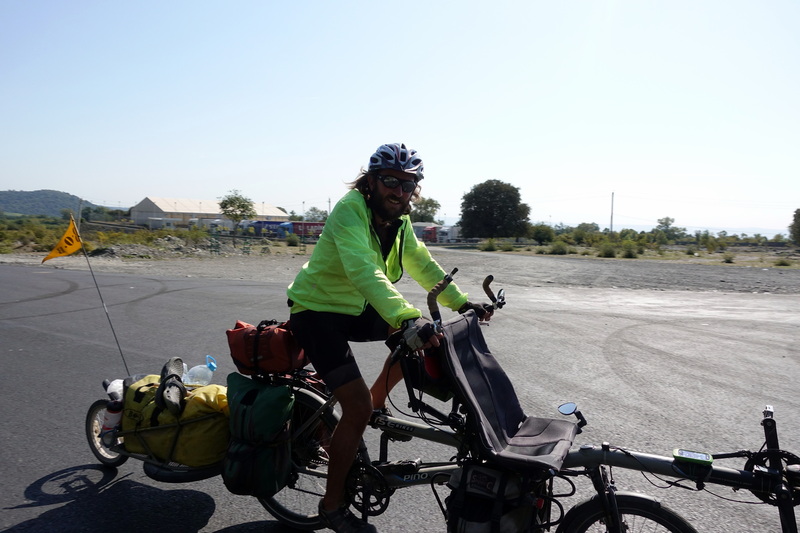 We had also seen the truck drivers for a few days on the Caspian Sea ferry, so we tried to brush off the altercation (although some international sign language was exchanged). 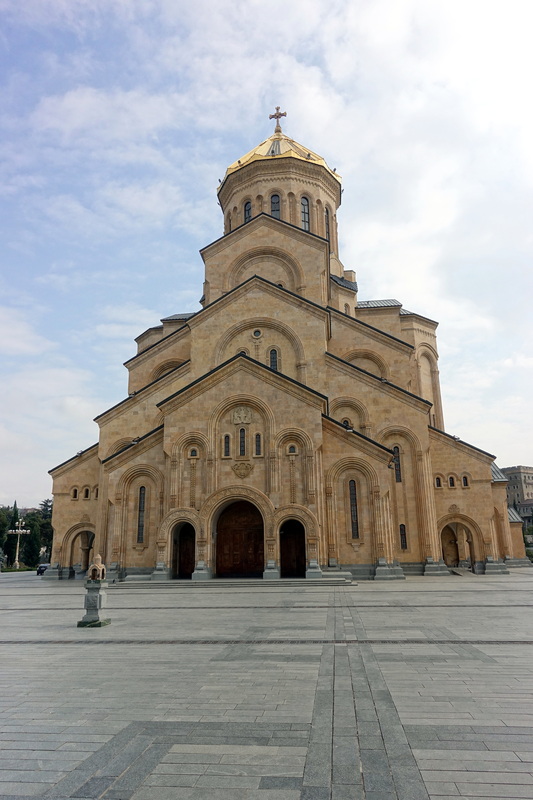 Is the most infamous of Georgian in history (Stalin) the extreme case of their behavior? We navigated the last few meters (and drivers who don’t look when they’re turning into traffic) to the guesthouse and spent the remaining part of the day tending to laundry (which hadn’t been properly done since Dushanbe) and stuffing our faces with Georgian food. Enjoying our first Georgian dinner and wine. Replete! We woke up the next morning to sunshine and clear skies – perfect riding weather. 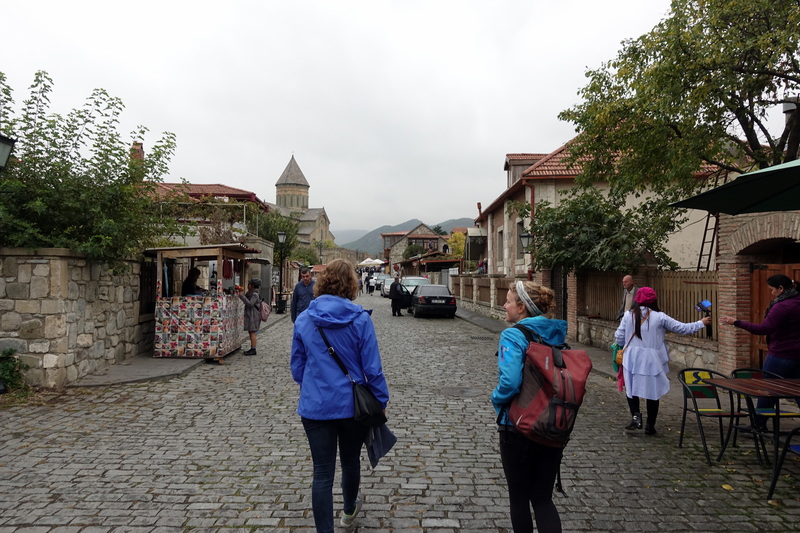 After a nice Georgian breakfast (cheese, eggs, and bread are the staples), we set off down the road. 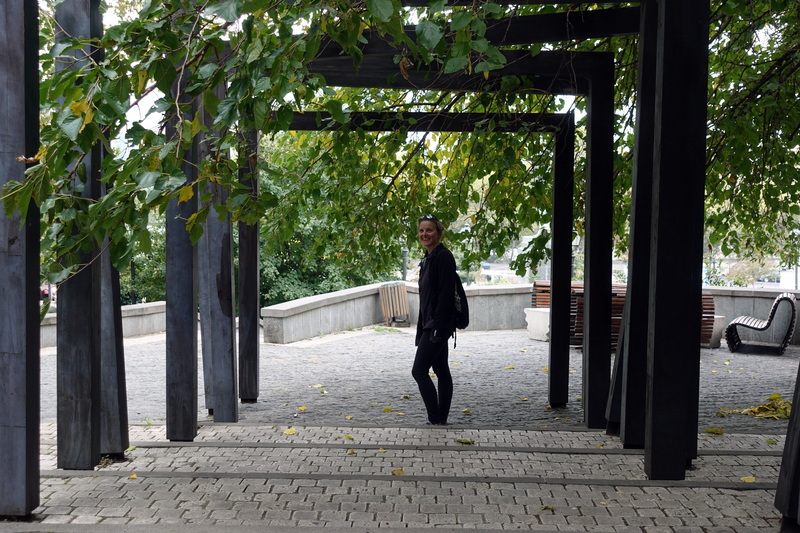 Being in a new country, we also kept our eyes open for the differences between Georgia and Azerbaijan. The village homes were no longer walled by cinderblocks, but now simple metal (often rusting) gates and fences, which allowed us to peer inside the yards. Dogs, surprisingly, became enormous and numerous once again – their size is typical of a Caucasian shepherd dog (link) that has to protect a flock of sheep against wolves and bears, but when they’re not with a flock and not chained to the house, they’re a bit terrifying. Those beasts can be up to 100kg and are not trained to be pet but for defense purpose. 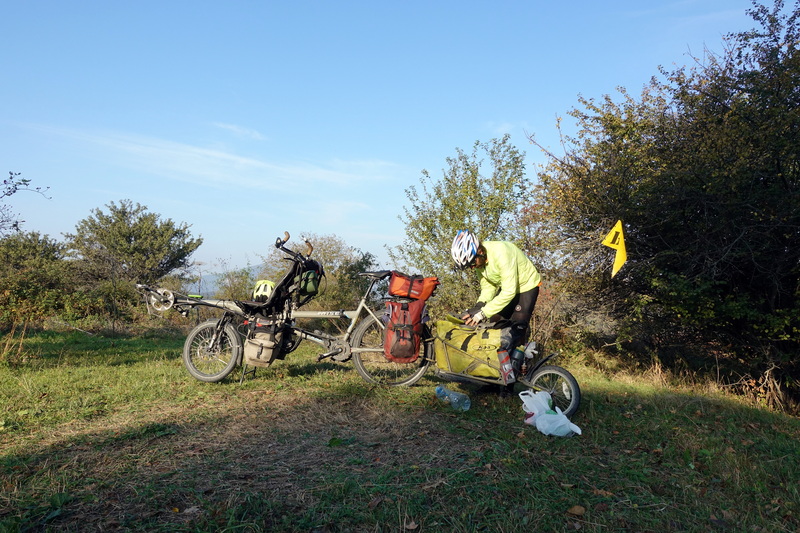 If one had the good idea to fully attack, our techniques developed in Thailand would hardly work – so I moved our knife from the panniers to a faster reachable place in the handlebar bag. Our first Georgian dog encounter of the day had an unapologetic owner pretend to calm down and contain monstrous Suzy, who ran after us once we got back on the bike. 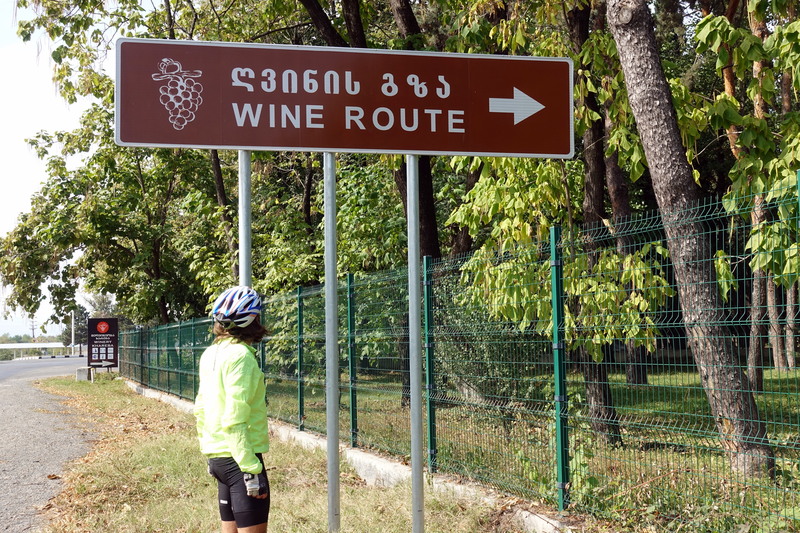 The rest of the day, we enjoyed cycling through vineyards and spotting old monasteries up in the hills, though a bit too worn out to actually cycle up and visit. 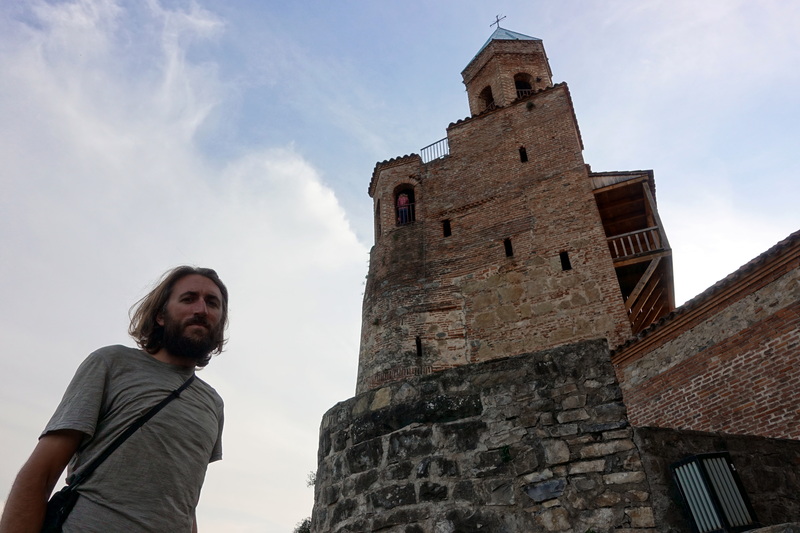 In the afternoon, we arrived at a guesthouse in Eniseli, unpacked our things, and walked down the road to the Gremi Fortress. Cédric decided to be double-layer extra-visible for the Georgian drivers. Probably not enough… we should design some laser installed under the saddle that would burn the tires of any car get too close and/or too fast. Wine country. 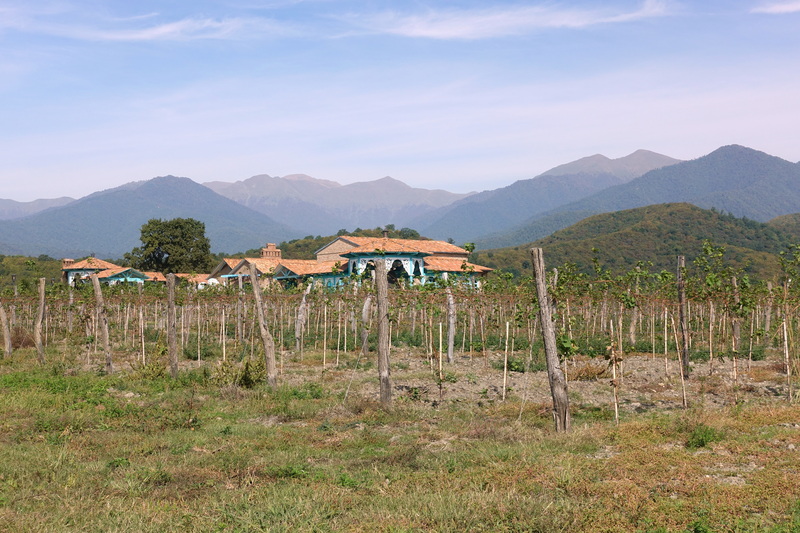 Georgians are very proud of their (often homemade) wine. 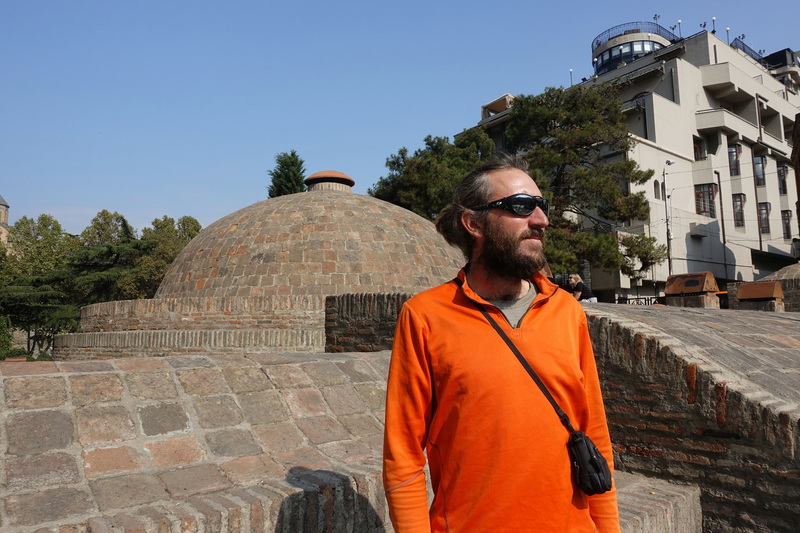 A Frenchman feels right at home… but actually not! Where is the brewery? We did not turn right btw, we have decided that all wineries that we have seen in numerous countries are always the same, the process shall not be too different in here. 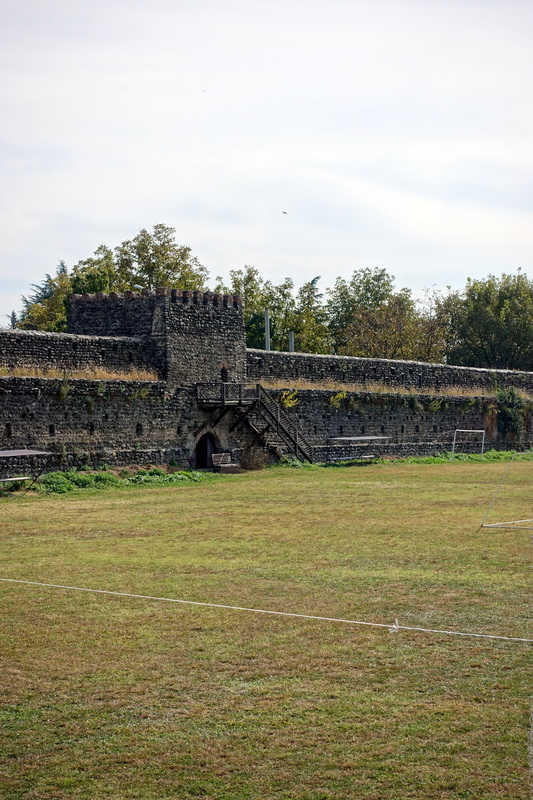 Our map said that there was a fortress in the middle of Kvareli… there was one, but converted into a football field. It’s at least an improvement after the fake castles of Azerbaijan hiding some dumps. We were surprised to see other tourists at the location, also wandering through the small castle museum (a group of British, for the joy of Cedric later who always associate their accent with some middle age lords at the service of queen Elisabeth…we have to entertain ourselves somehow!). 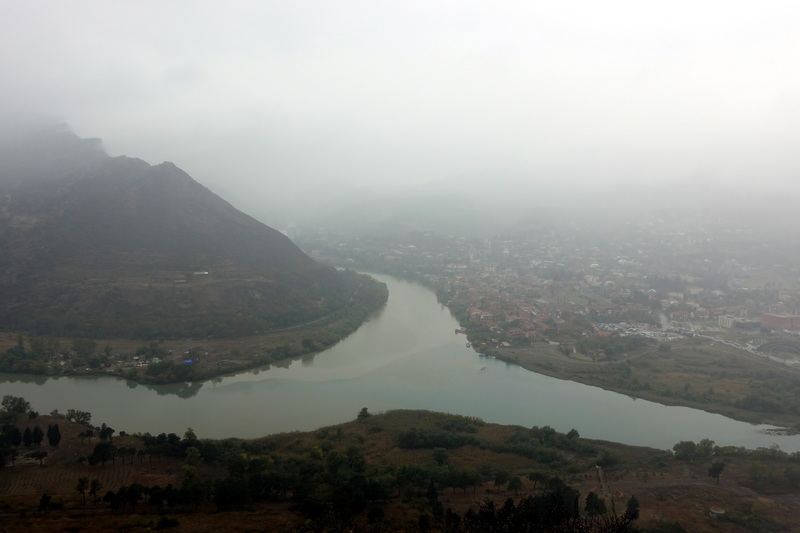 Given the weather, the views of the area from the fortress were also amazing. 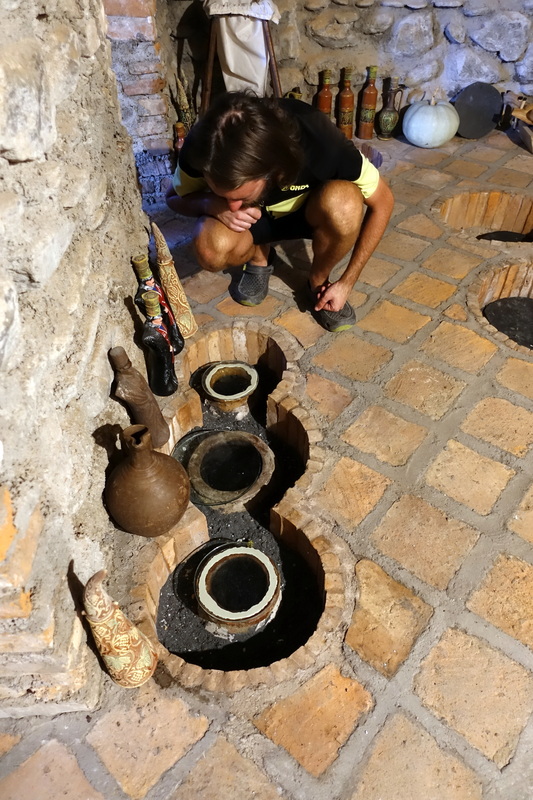 In the evening, Cédric and I had dinner with our hosts where wine and delicious food flowed for multiple hours. 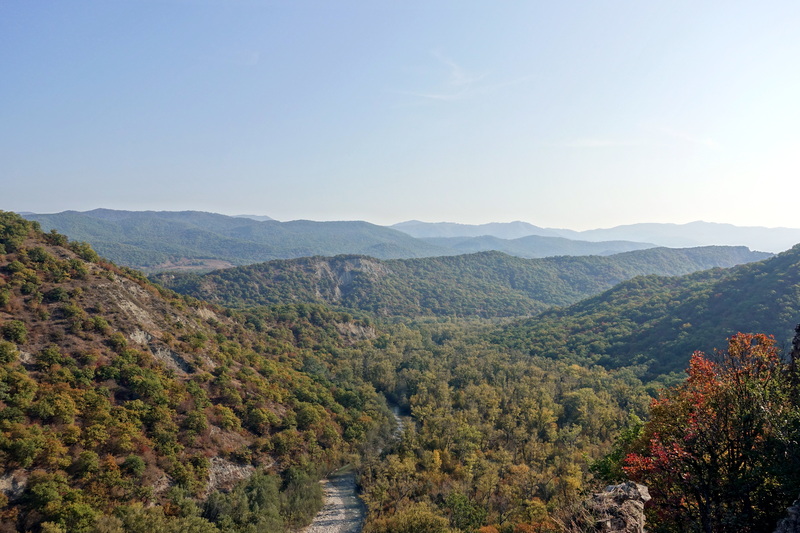 Georgia didn’t excel simply in great foods, but also its variety of fresh foods- we even tried a new fruit, the jujube. 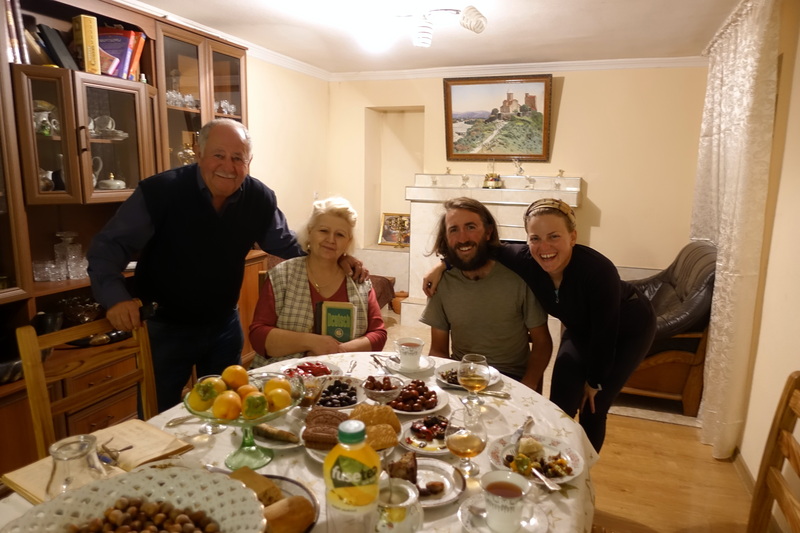 Another epic Georgian dinner – with loads of homemade wine. They kind of tricked us at the game: you apparently cannot drink water, first the grandma alone started drinking wine with us and at some point finds an excuse to leave (playing piano and learning German), but call the grandpa to take over the drinking game. The wine tastes better at the 5th glass – true story. The next morning, I medicated my slight wine headache before having a lavish breakfast with our host. Apparently, given that our hosts encouraged us to drink several glasses, we figured that the wine somehow tastes better at the second or third pitcher. 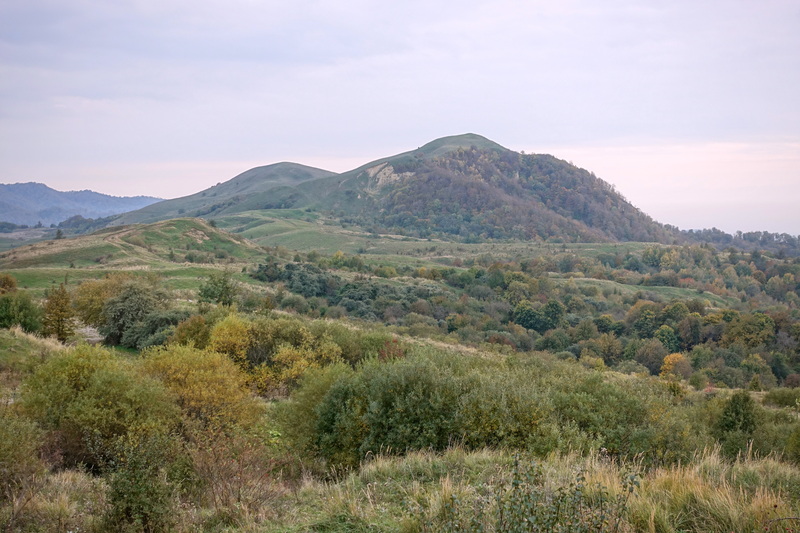 Over some khachapuri (an egg and cheese pastry – the Georgian pizza or quiche), we discussed the big dogs and he told us, with a straight face, to get either a Taser or some small mortars to keep the dogs at bay. It was reassuring to know that it wasn’t just us who felt that these dogs were problematic. 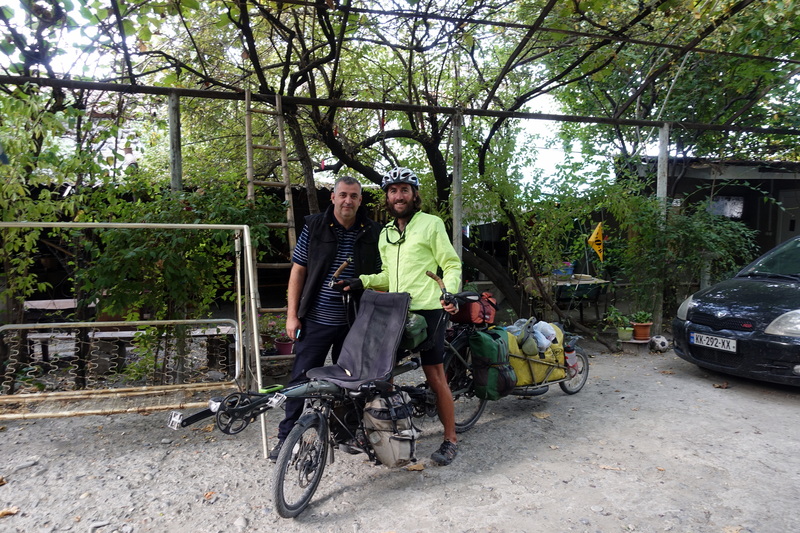 By the way, after Gerald from Geraldine in NZ, we were now hosted by Giorgi “the Georgian” (we realized later that enough Frenchmen are also named Francois)! Uuuuuphill on the Gombori pass. When we’re quick, we can get people to take a picture of us with our camera too! The next morning, it was brisk, but the clouds had cleared. 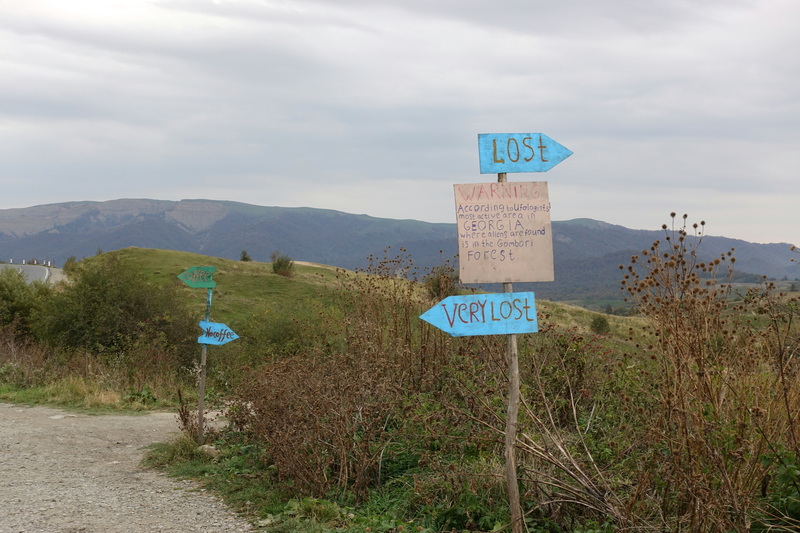 After a long day of climbing, we appreciated the mostly downhill route towards Tbilisi. 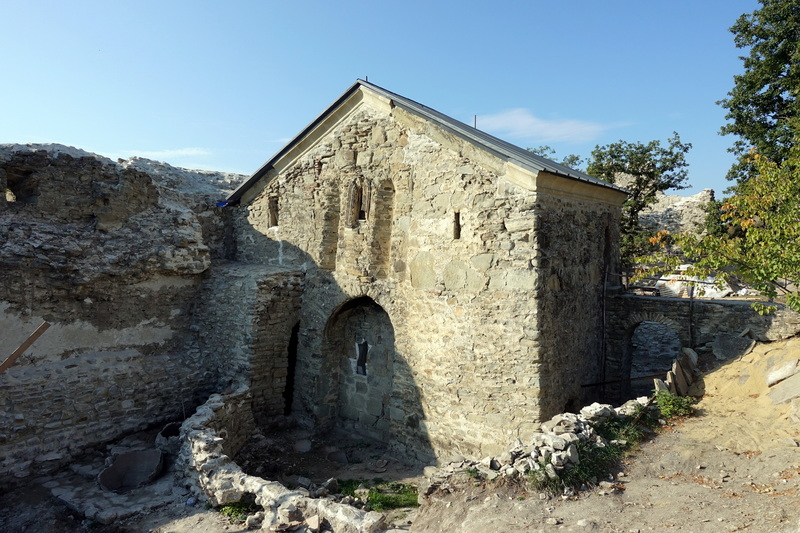 Midmorning, we stopped by a the old Ujarma fortress to check it out but were a bit disappointed to find the ruins a huge construction site – the fortress might make it on the guidebooks in 2025. 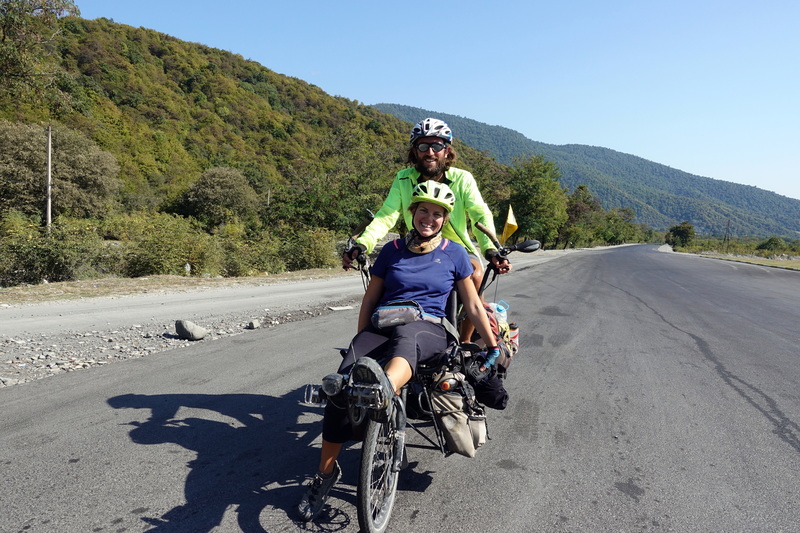 The rest of the morning was spent sharing the main road into Tbilisi, but as we approached the city, we found a service road that worked wonders as a bike lane. After navigating the downtown, we stopped by a Wendy’s/Dunkin Donuts chain to gorge on Western fast food. It’s not that we were necessarily craving burgers and fries, but it wasn’t barbecue meat and we were starving. 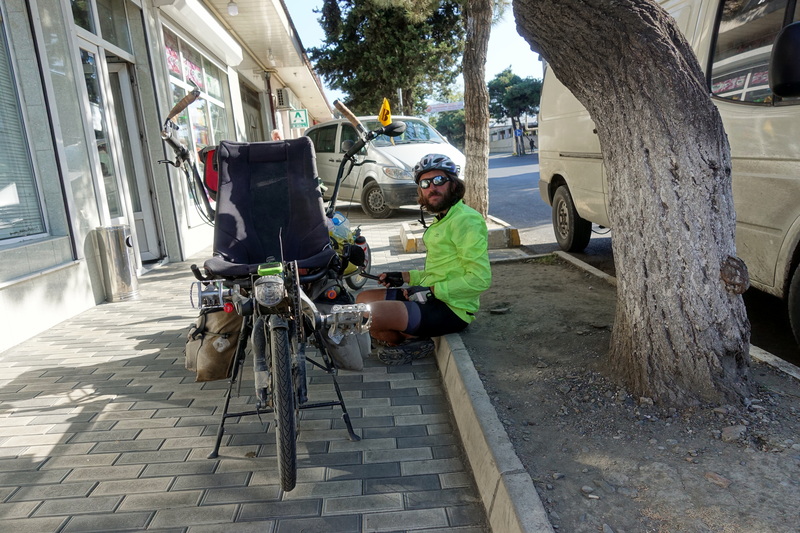 As we were sitting on the sidewalk and eating our burgers, two South African women came up to tell us that they saw us cycling earlier in the day, and yes, Georgian drivers are also the worst they experienced. 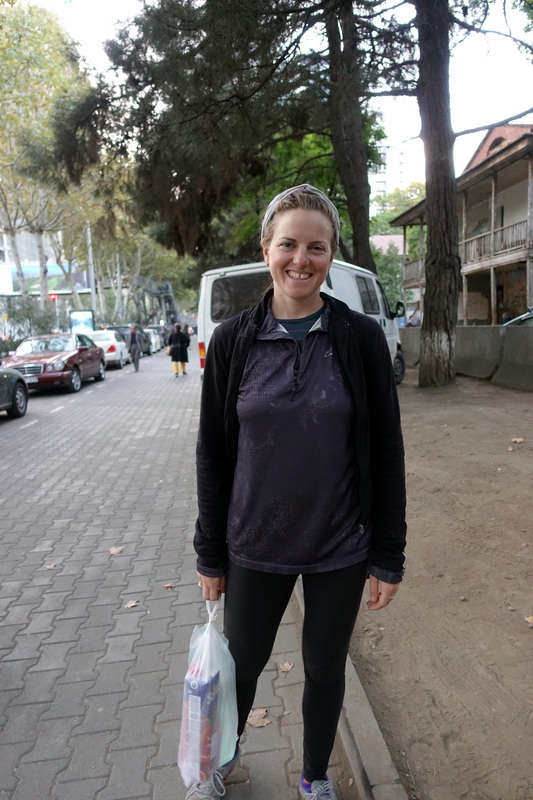 After cycling to our guesthouse, we walked around the neighborhood to find a bike shop to look for bike clothes and shoes. 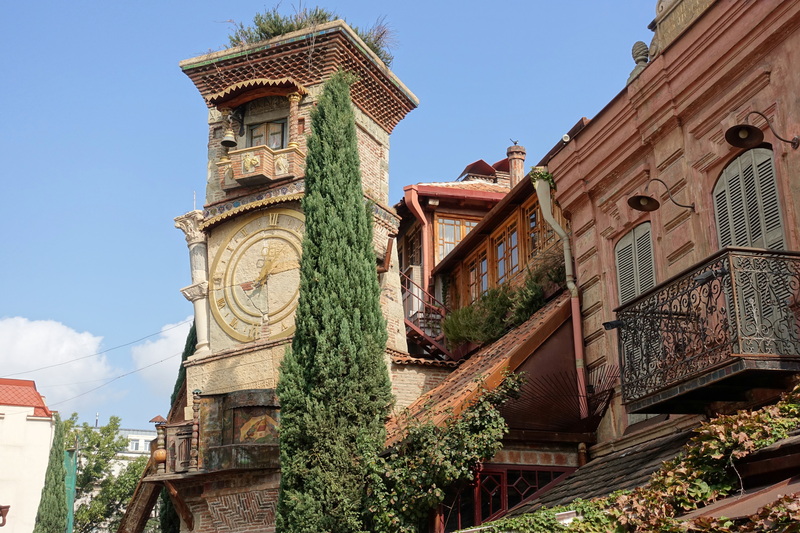 Even more than Baku, parts of Tbilisi could have been transported from directly from any major European city – we found Austrian bakeries, upscale international eateries, and high-end design shops. 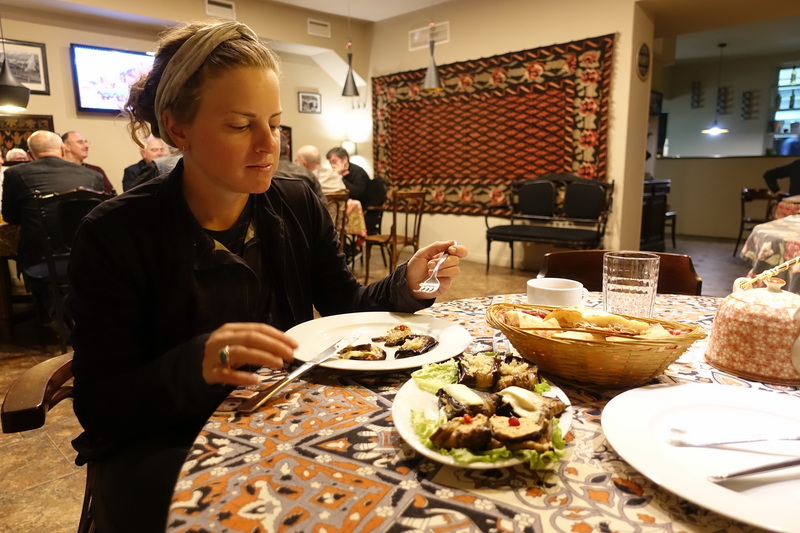 We ended our day at a local restaurant, trying more of the great Georgian dishes. Walking around the city and looking for bike parts – complete failure. 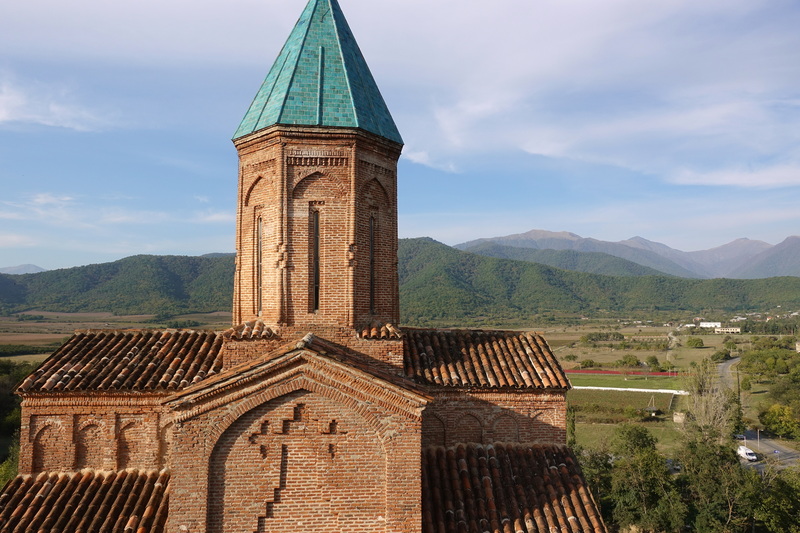 Georgians have enough money for anything related to Mercedes or BMW but we didn’t see too much investment related to physical exercise. Compared to all the previous countries, Georgian men are also a bit more portly – our first remark after the border. 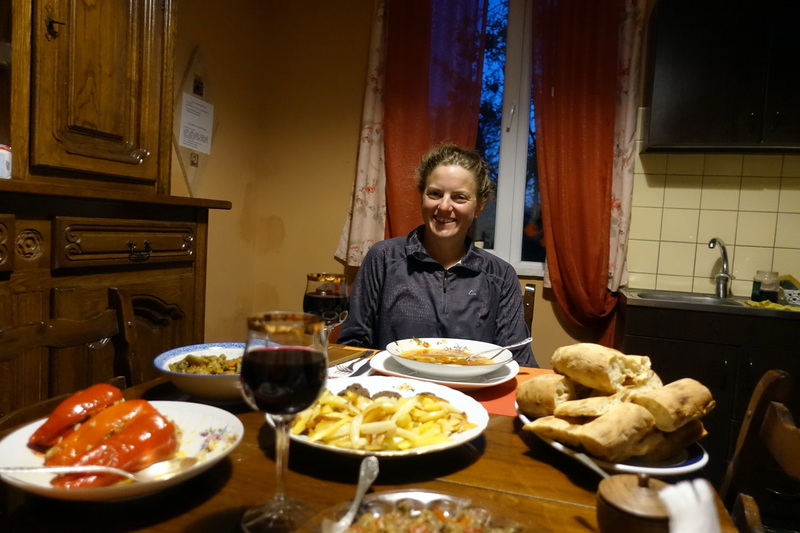 Enjoying another Georgian dinner – everything is better than our ketchup/noodle camp dinner, or pretty much any meal in the previous 3 months. Multiple plates and we finished it all! 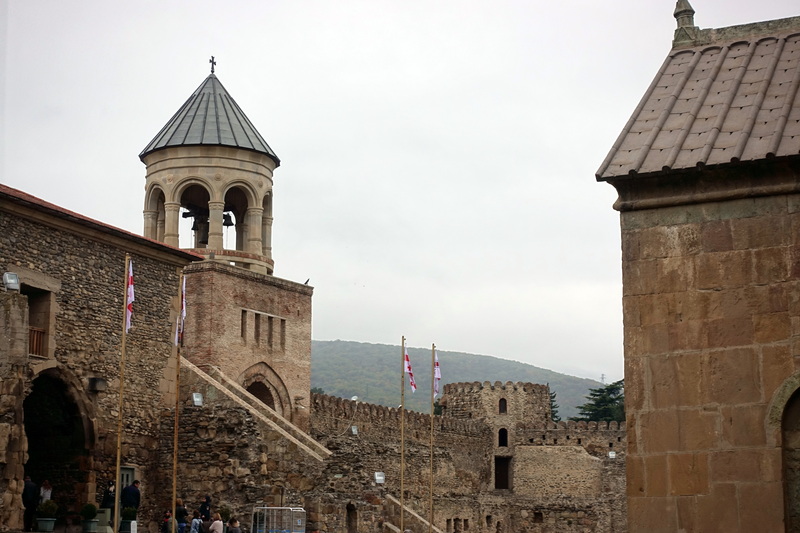 We decided to spend two days in Tbilisi to see more of the country’s historic sites. 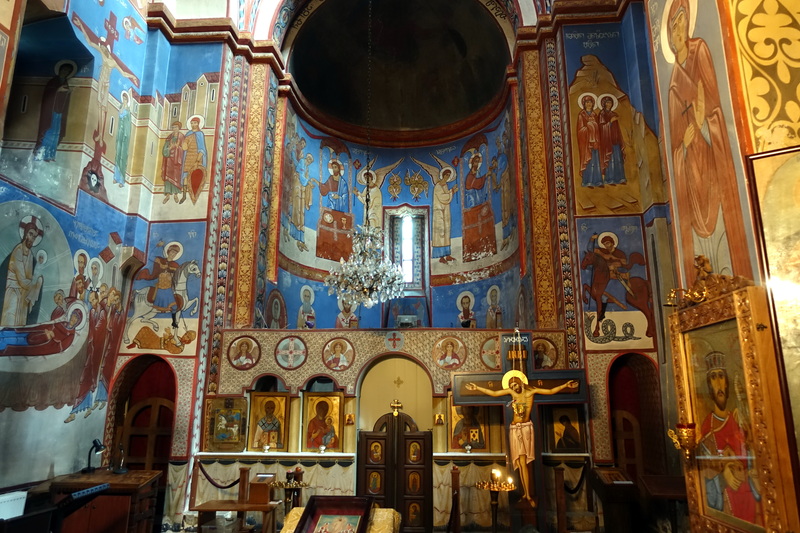 The first day, we wandered throughout the whole city, loosely following a walking guide and visiting every church possible. 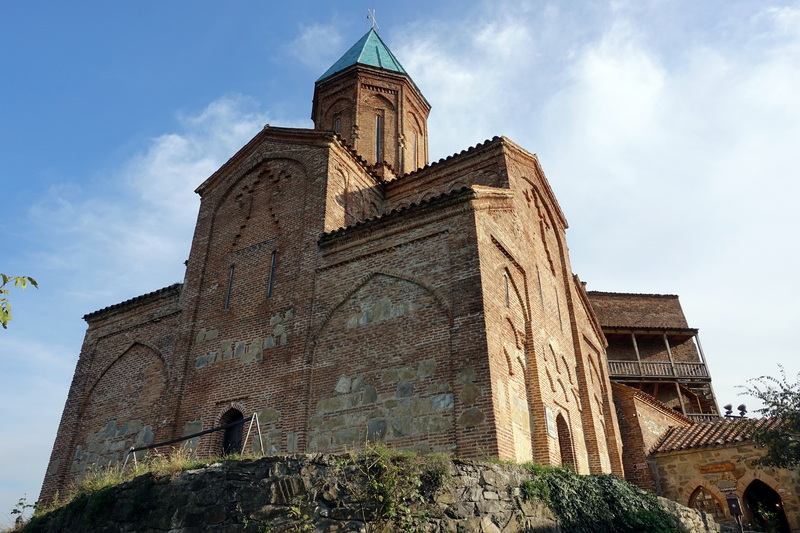 The Georgian Orthodox churches have a (sometimes strictly enforced) dress code, which requires men and women to be dressed conservatively (no bare skin) and head coverings. 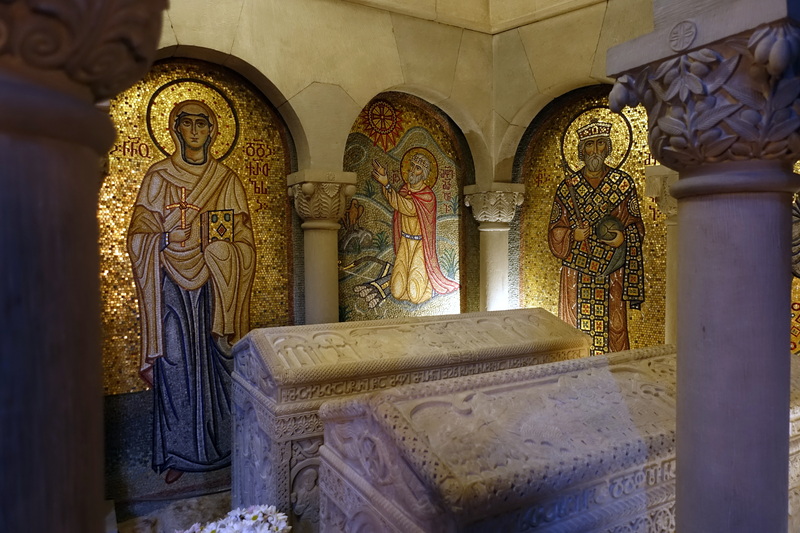 When in the churches, we were also surprised to see a sizeable younger crowd of worshipers. 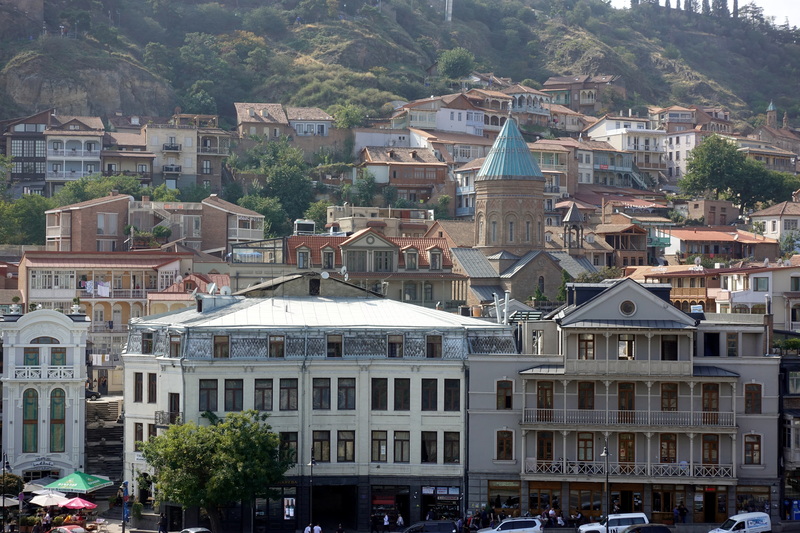 The old town of Tbilisi was nice but felt a little too manicured and catered largely to tourists. 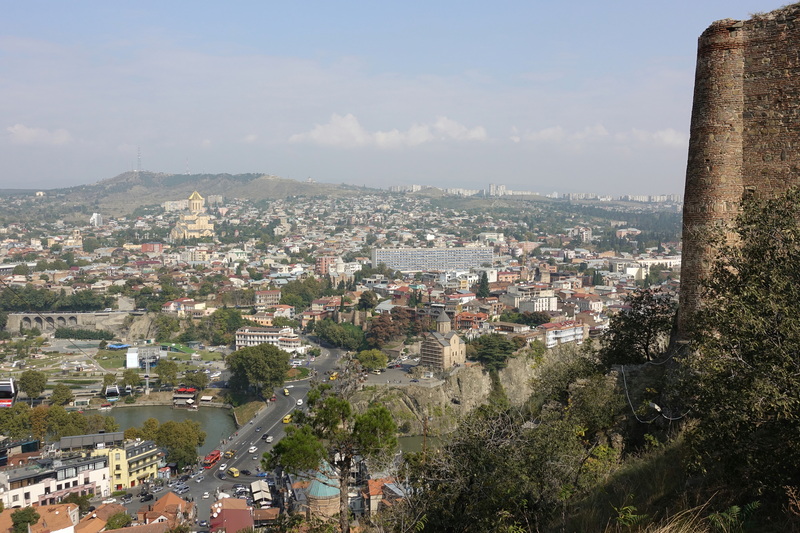 Since the weather was optimal, we also climbed up to the old fortress on top of a hill overlooking the city. 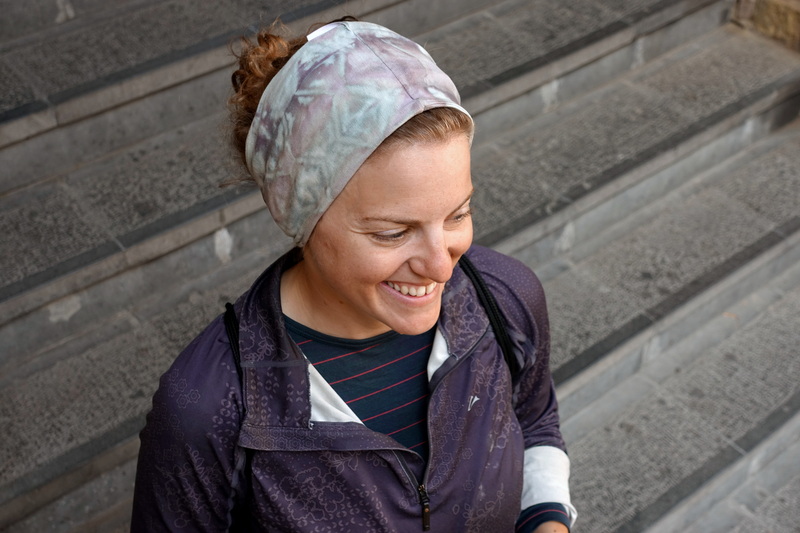 In the afternoon, we took the subway to look for outdoor clothing in the bazaars outside of the downtown. Colder temperatures were fast approaching, and I was in need of another top layer and Cédric possibly shoes (his bike cleats were breaking in a few critical places, and he has only flipflops otherwise) and bike tights. We found the first two items at a good price, although our name brand items also had a few hallmark signs of being quality knockoffs. 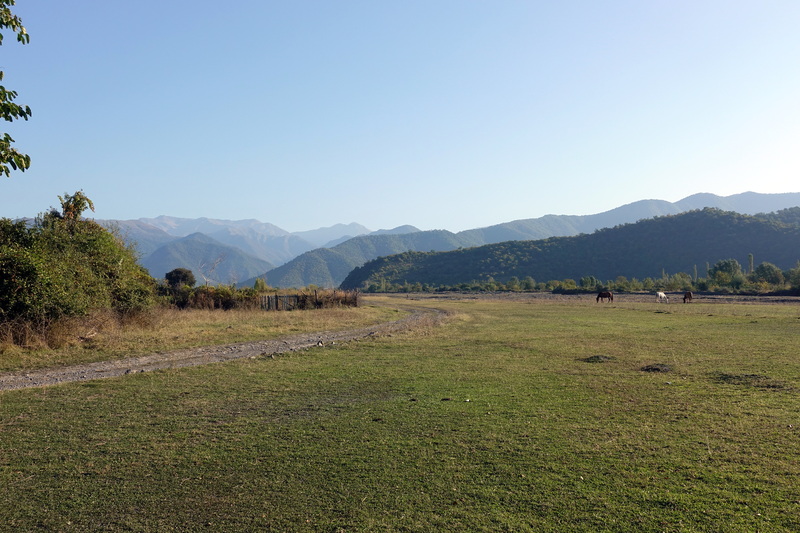 Bicycle clothes and components are non-existent in the Caucasus – even the bazaar of Dushanbe in Tajikistan was better supplied. 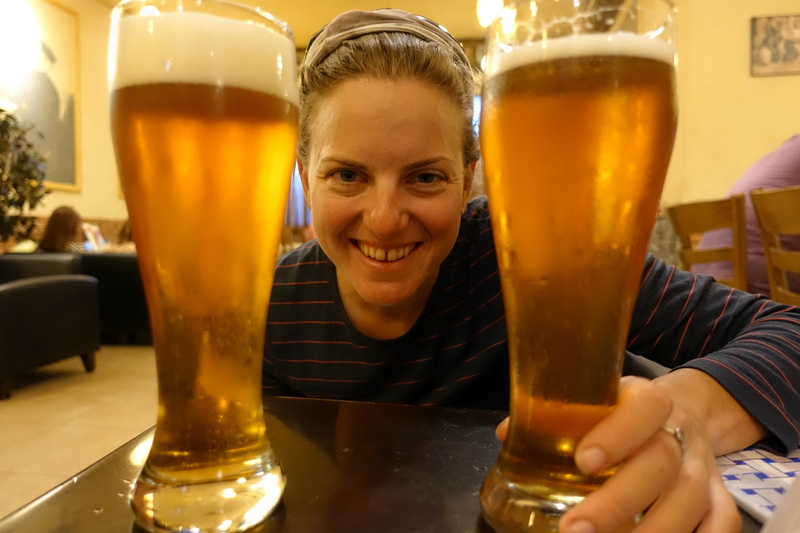 Apparently, Georgians do not have enough money to buy cycling gear – they however seemingly have enough to buy luxury German cars… We went back to our guesthouse and spent the evening cooking our dinner and chatting with the owner of the guesthouse. 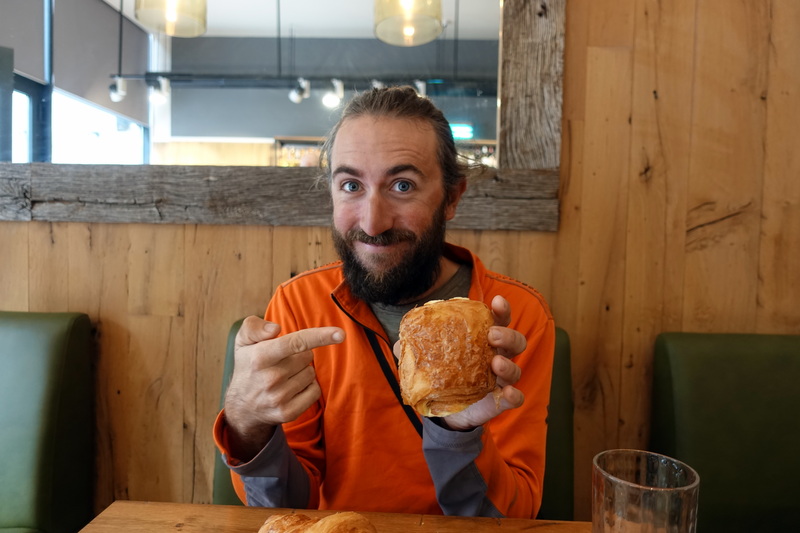 Cédric found is chocolatine – after days of craving one. We came back to the exact same place the next morning too. 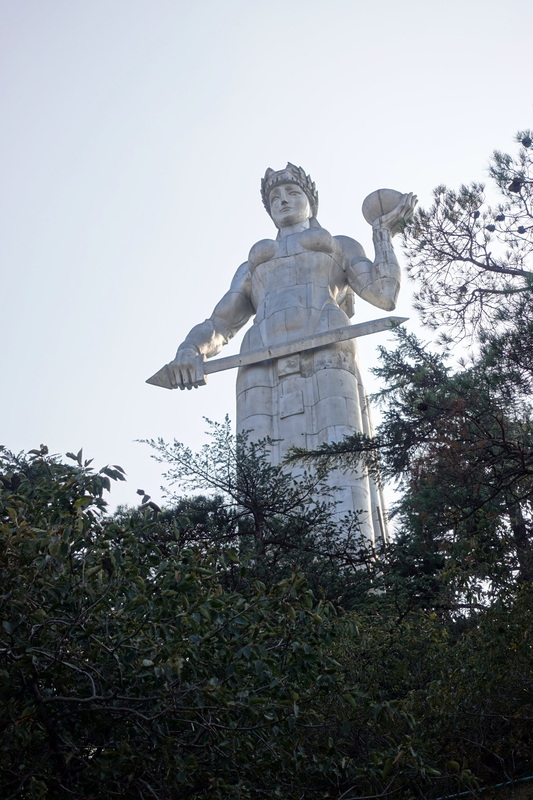 The Mother of Kartli – constructed as a symbol of Georgian national character that we felt was a bit too on the nose. The cup of wine is for friends, the sword is for enemies (according to guidebooks). We figured that it would also work for drivers: the cup and the sword for inebriation and hostility. 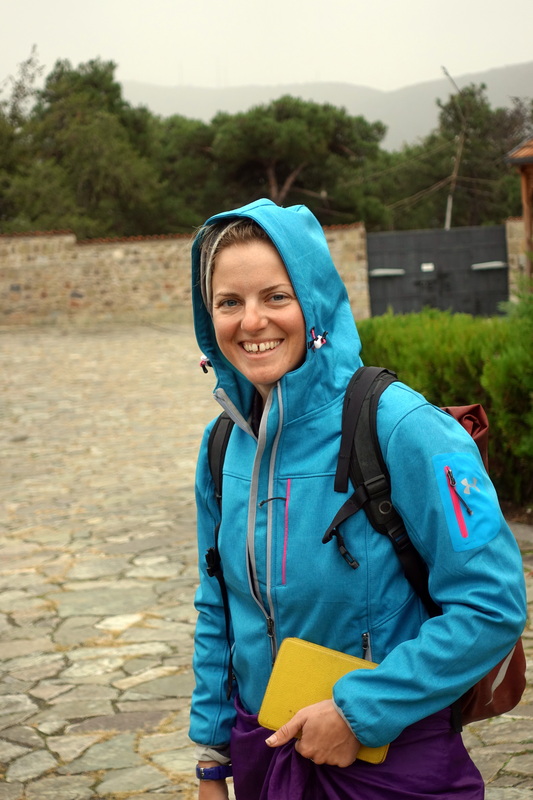 Excited by our purchase – probably all fake, but we just have to make it to a Decathlon in Istanbul. 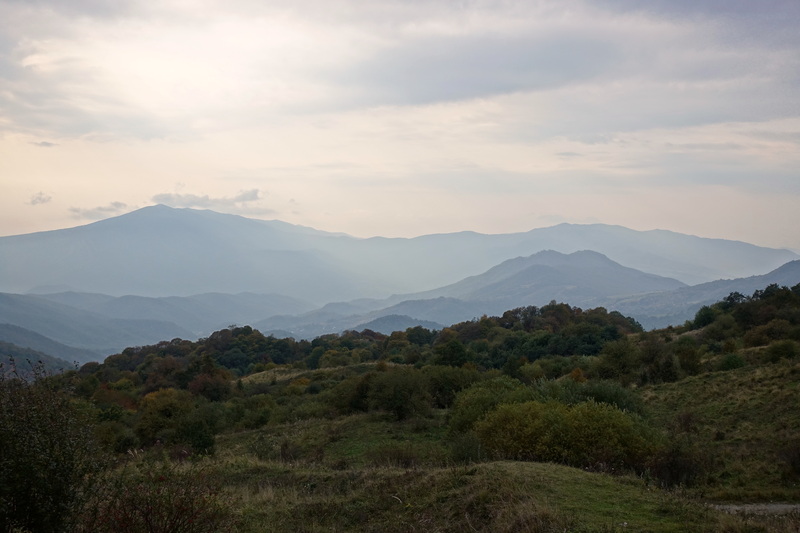 The next day, we set off in the direction of Mtskheta (yeah, easy to pronounce right? 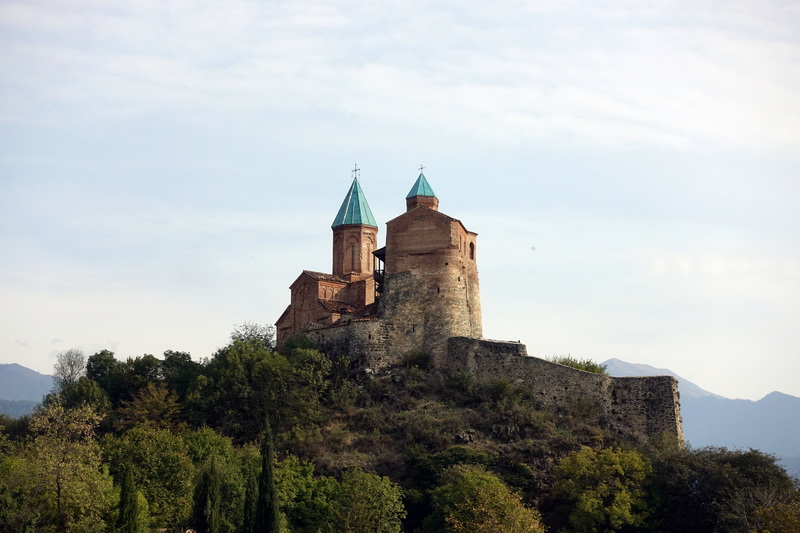 ), the birthplace of Georgian Christianity. First, we needed to visit a bakery chain we quickly fell in love with; finally, crusty bread, chocolatine, and real espresso! One of the benefits of cycling west towards Europe is that we slowly catch glimpses of ‘home’ that we never realized we missed (I’m still waiting for my Quiche, though). 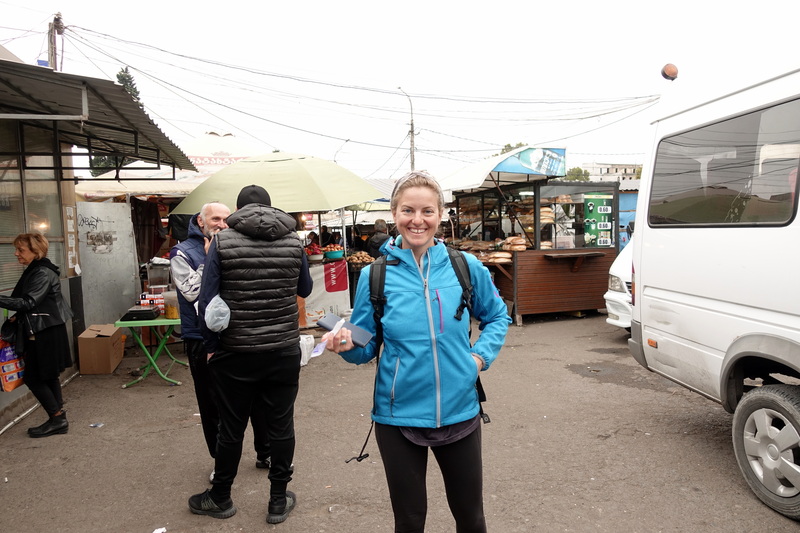 To get to Mtskheta, we first needed to get to an outer bus terminal, then find a marshrutka (collective van) to take us to the town. 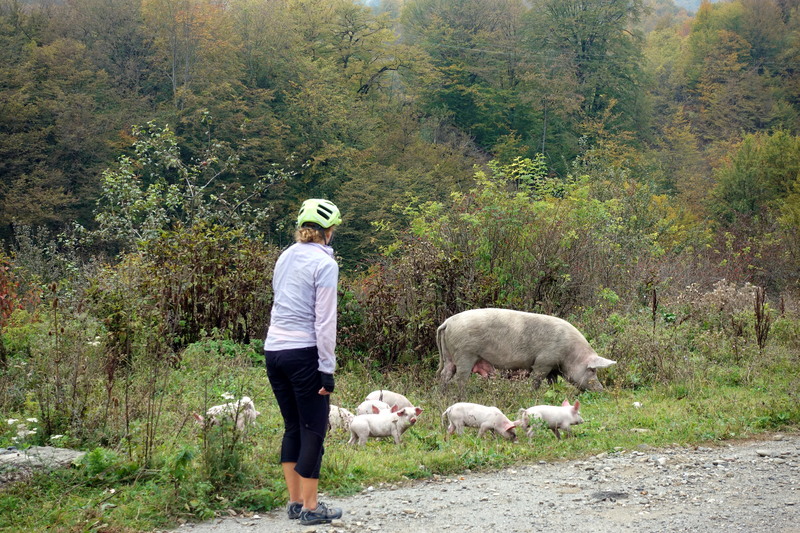 While on our way, we met another German tourist with whom we spent the day with. 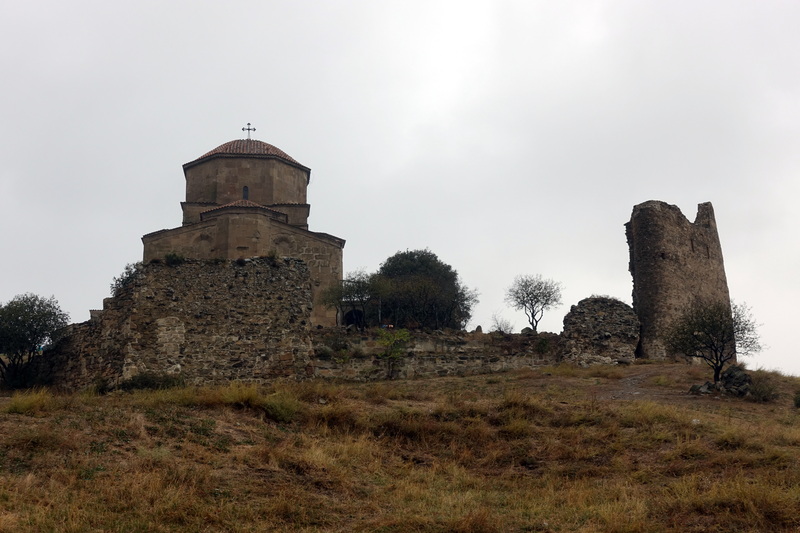 We walked around the holy sites of Christian Georgia and visited the Jvari Monastery up on a hill overlooking the town. Unlike the day before, we had drizzle and low-hanging clouds, so the view wasn’t as impressive as we’ve seen on some postcards. 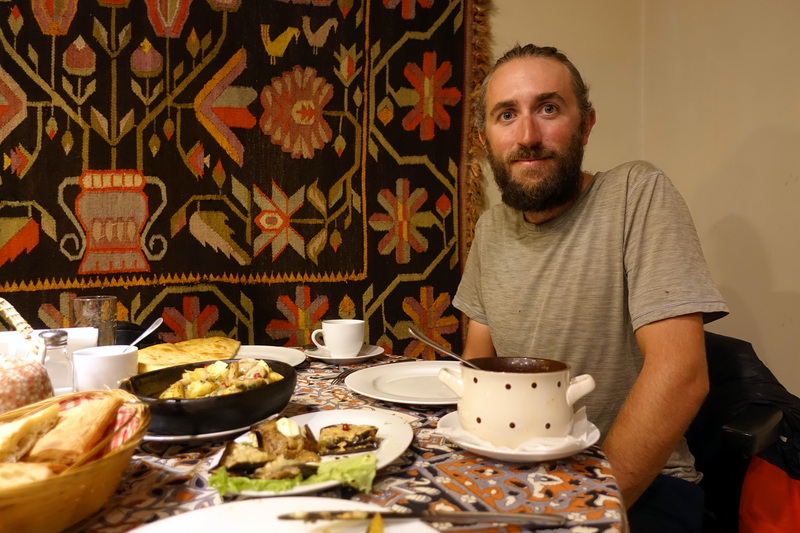 After we got back to Tbilisi, we wandered back to our guesthouse, where we made another home cooked meal (Cédric picked up the ingredients at a place called ‘Europroduct,’ which stocked… you guess) and prepared for the ride the next day. 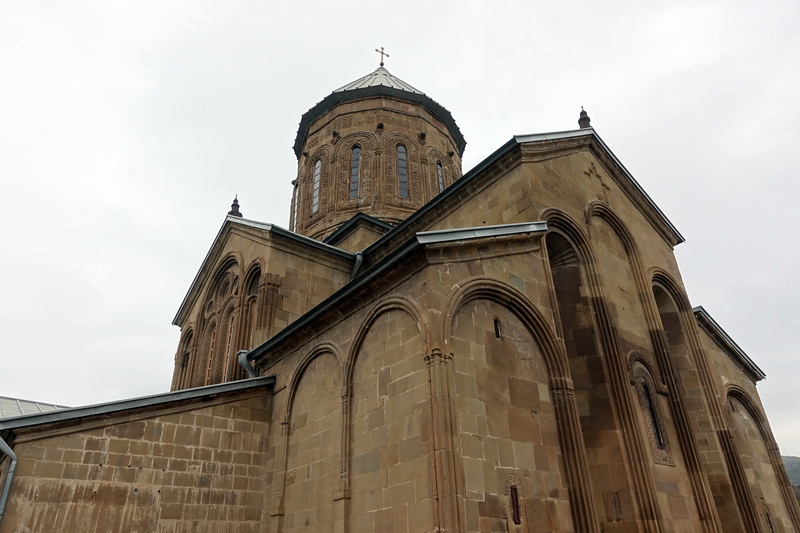 We were supposed to have amazing views from the Jvari Monastry – it rained. 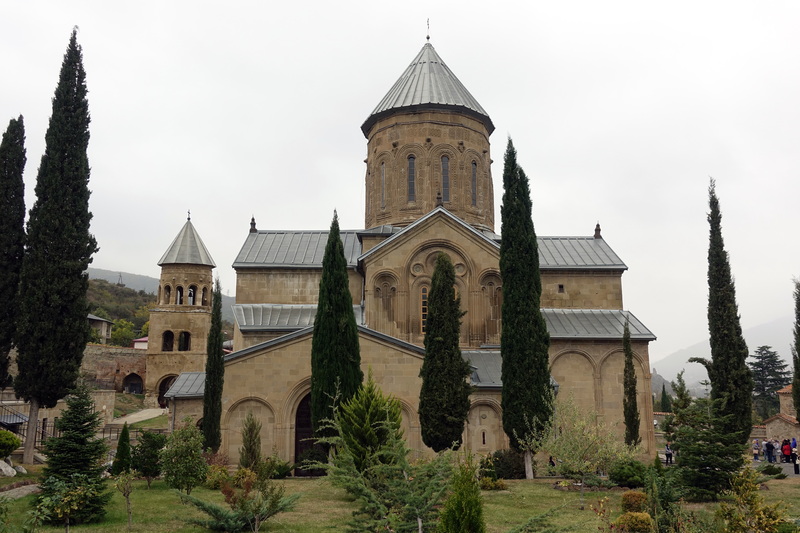 The Jvardi Monastry – the holiest of the holy places of Georgia. 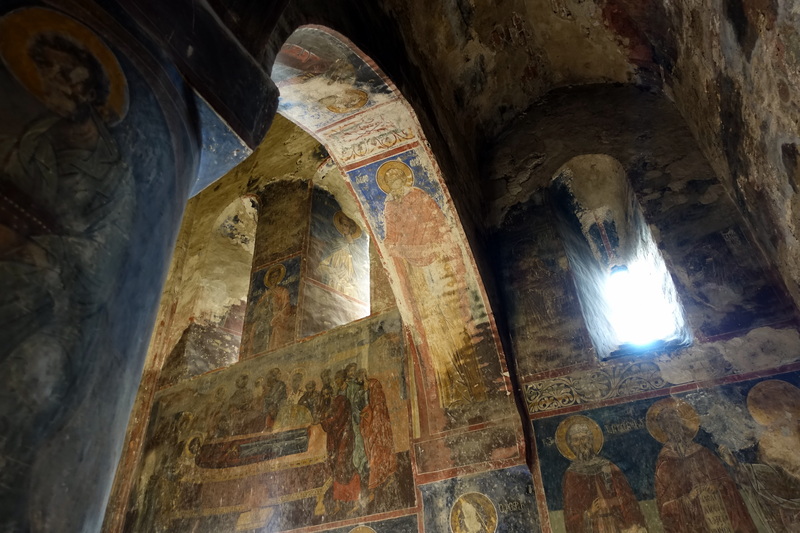 Ancient baptism, pilgrimages and miracles involved in the story. Hehe, we only send postcards to our best post commentators! As for post commenting, I can’t compete with Ruth! Actually, according to our stats Ruth’s son has posted more comments than Bob’s mum! We’ve just reached our 15000th Kilometer by the way!